nursing care, the institution sends trained nursing staff for advanced studies of B.Sc. (Nursing) refresher courses, workshops and ward administration courses, etc. The Hospital also has a School of Nursing attached to it. A separate building for school of nursing was constructed in the year 1977, with adequate facilities for lectures, demonstrations and offices. The School of Nursing attached to Gandhi Memorial and Associated Hospitals, Lucknow provides 2 types of courses, viz., (1) General Nursing Diploma (3 year course) and (2) Midwifery Diploma (6 month course), which started in 1973. The midwifery course has 20 seats and is held at the Queen Mary's hospital. Candidates are eligible to apply after passing Intermediate Examination. Admissions are made through a competitive examination conducted by Director, Medical Education & Training, Uttar Pradesh. The present Principal of the school is Ms. P. J. Briscoe. There is a Nurses Hostel having mess facility, where about 300 students and staff nurses are accommodated. Adjacent to this, there is a new hostel with single room accommodation, constructed in 1970, where 50 staff nurses are residing. There is also a double storied building where Assistant Matrons, Tutors and Sisters are accommodated. 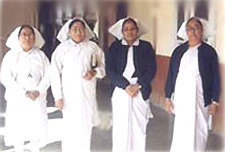 The Senior Matron is provided family accommodation.